Montgomery faces the hurdle of explaining why, if low-density suburbs cause unhappiness, so many millions of people, over so many decades, across several countries, flocked to that way of life. As he writes, ‘since 1940, almost all urban growth has actually been suburban.’ He must account for this fact, even though it means little to him personally. For the green-tinged intelligentsia, working and middle-class people are pawns who rarely think for themselves. Still, in Montgomery’s case the hurdle is high, since his objections to dispersion go much further than conventional gripes about fragile economic foundations. Happy City does peddle the myth, in passing, that the financial crisis brought suburbanisation to a crashing halt. There’s an assertion that ‘census data in 2010/2011 showed that major American cities showed more growth than their suburbs’, and a hope this points to forces ‘systemic and powerful enough to permanently alter the course of urban history’. Montgomery even compares buying a detached home on the urban edge to ‘gambling on oil futures and global geopolitics’. As it turns out, he misconstrues the available data. Suburbanisation barely missed a beat in the United States and continues in earnest. Montgomery’s essential point, though, is that suburban life is contrary to deep-seated human yearnings. This endows him with an even more patronising attitude to working people than his forerunners Richard Florida – who endorses the book – and Edward Glaeser. One line of argument in Happy City, which also features in Glaeser’s Triumph of the City, claims dispersion was forced on people by greedy land owners and property developers in cahoots with weak-kneed or compromised politicians and officials. He puts it his way: ‘sprawl, as an urban form, was laid-out, massively subsidized and legally mandated long before anyone actually decided to buy a house there … it is as much the result of zoning, legislation and lobbying as a crowded city block.’ In another chapter, Montgomery warns of the challenge for pro-density New Urbanism: ‘the system that built sprawl – huge state subsidies, financial incentives and powerful laws – is still in place.’ Popular preferences don’t even rate a mention. Similar comments appear throughout the book, adding up to an audacious feat of historical revisionism. The standard interpretation of urban evolution, from the walking city to the monocentric and then polycentric metropolis, places breakthroughs in transport technologies first, most notably railways, streetcars (trams) and affordable motor vehicles, followed by mass shifts in transportation modes and population movements second, with land owners and politicians ready to exploit the new conditions. Of course, transportation technologies have such a powerful impact because of pent up demand for space and lower densities. Peter Hall in Cities in Civilization, discussing Los Angeles: ‘the car was doing more than decentralize; it was decentralizing in a new way’. Such quotes can be piled up all day long. Happy City is open to the same criticism as Glaeser’s book, namely that as a matter of chronology, urban dispersion took off before the interstate highway system, tax deductibility of home mortgage interest, the relative decline of inner-city schools, many development controls, and other factors cited by both as having pushed Americans to the periphery. In Downtown: Its Rise and Fall 1880-1950, Robert Fogelson explains that ‘by the mid and late 1920s, however, some Americans had come to the conclusion that the centrifugal forces were beginning to overpower the centripetal forces – or, in other words, that the dispersal of residences might well lead in time to the decentralization of business.’ And suburbs have been popular in countries other than the US, like Australia, where these sorts of factors are absent. For his part, Montgomery envisages an alternative past, in which demands for space and mobility hardly figure. ‘Well, the path that led … to today’s sprawl was not straight’, he writes, ‘it meandered back and forth between pragmatism, greed, racism and fear.’ Rewriting history may be audacious, but that’s just the beginning. The book doesn’t stop at denouncing suburbanisation as a form of organised compulsion. Montgomery’s ultimate purpose, drawing on ‘happiness science’, is to expose suburban life as a mass delusion. ‘We need to identify the unseen systems that influence our health and control our behaviour’, he writes. Much of Happy City is devoted to a succession of studies and experiments by a range of neuroscientists, psychologists and behavioural economists on the conditions that stimulate feelings of well-being and contentment. Montgomery focuses on research into different spatial environments: densely or sparsely populated, high-rise or street-level, crowded or uncrowded, mixed-use or homogenous, auto-dependent or walkable, near or far from nature, and so on. Neuroscientists have found that environmental cues trigger immediate responses in the human brain even before we are aware of them. As you move into a space, the hippocampus, the brain’s memory librarian, is put to work immediately … it also sends messages to the brain’s fear and reward centres … it’s neighbour, the hypothalamus, pumps out a hormonal response … before most of us have decided if a place is safe or dangerous … places that seem too sterile or too confusing can trigger the release of adrenaline and cortisol, the hormones associated with fear and anxiety … places that seem familiar … are more likely to activate hits of feel-good serotonin, as well as the hormone that … promotes feelings of interpersonal trust: oxytocin. He considers these important explanations for the appeal of suburban lifestyles when denser neighbourhoods are better for physical and mental health, at least according to his interpretation of studies and experiments on walking, cycling, social encounters, community activities, public space, streetscapes, grid planning, on-street parking and traffic velocity. But his method of selecting a body of research, cobbling the results together, and equating this to the preconditions for a happy life, suffers from a fallacy of composition ─ the error of inferring that something is true of the whole from the fact that it is true of some part of the whole. Although Montgomery claims ‘most people, in most places, have the same basic needs and most of the same desires’, it doesn’t follow that research findings on parts of life should add up to a real whole life. There’s no reason why urban planning should start from abstract assumptions drawn from a bunch of controlled experiments, rather than from masses of people weighing up their full, lived experience. In the end, Happy City fails to prove the assertions trumpeted in its opening pages. It fails to produce any direct evidence connecting flatlining assessments of well-being or rising rates of depressive illness to ‘sprawl’. Nor is there any indirect evidence from which a connection can be inferred. Just as research on parts of life don’t add up to a whole real life, neither can studies and experiments finding discontent in particular conditions translate to generalised disenchantment with a whole way of life. Montgomery’s style is to fill the gaps with a series of conveniently chosen anecdotes and vignettes, some designed to trash suburbia and others to wrap a glowing aura around transit-oriented density. Randy Straussner’s super-commuting horror story, which never goes away, is an example of the former. But the star of the book, and prominent case of the latter, is ‘The Mayor of Happy’. At the helm of impoverished Bogota between 1998 and 2001, Enrique Penalosa cancelled a highway expansion plan, used the funds for hundreds of miles of cycle paths, hiked fuel taxes by 40 per cent, banned drivers from commuting by car more than three times a week, introduced car-free days, dedicated a new chain of parks and pedestrian plazas, and built the city’s first rapid transit system. 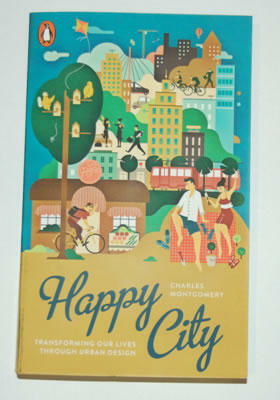 This made him a guru to green urbanists like Montgomery, who was inspired to write Happy City. ‘We might not be able to fix the economy’, Penalosa is quoted as saying in the book, ‘we might not be able to make everyone as rich as Americans … but we can design the city to give people dignity, to make them feel rich.’ Confronting an unemployment rate of 18 per cent when Penalosa left office, however, many Bogotans would have longed for the real thing. John Muscat is a co-editor of The New City, where this piece first appeared.